This entry was posted on Wednesday, January 20th, 2010 at 9.57 am and is filed under (Dark) Viggen, (Nicks) Viggen, Powertrain. You can follow any responses to this entry through the RSS 2.0 feed. You can leave a response, or trackback from your own site. This is exactly what I am looking for/interested in doing with my Viggen. What would we expect the pricing to be for this system? Shoot me an email nick@ this site.. Certainly not a cheap system as you can see. Full stainless tig welded. Not an economy JT for sure. We just did one for a customer car too so I can lookup the cost for you. If i add this to my stock viggen will it lose power due to less back pressure? Hey you just sent a upgraded ecu to a Mr willard in va beach, virginia(99 viggen). Their ecu went bad. Yep helped the out with their broken factory ECU.. Couldn’t leave it stock power either so turned it up for him a bit. Just a stg.75 or something. 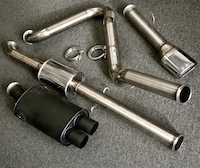 3″ exhaust would be overkill but not hurt anything. Anything to help lower the backpressure improves turbo response. Want to know what is all needed to get my stock 02 convert viggen just north of 300hp. http://www.genuinesaab.com/catalog/product_info.php?cPath=56_61&products_id=193 This would be a good place to start. l am interested in item. will it fit my 2000 viggen and how much is it? get back to me.